This wine is one of several surprises in 2013. Normally we use the Grenache from Rossi Ranch as a base for our Chateauneuf-du-Pape-inspired “Three Birds”, a traditional blend of Grenache, Mourvèdre, and Syrah. But when it came time to do blending trials, despite the Grenache being better than ever (un-freakin’-believable!) no matter what we tried, we could not improve upon the Grenache by itself. Eventually we got the message. This Grenache didn’t want to play with others; it wanted to be bottled on its own! 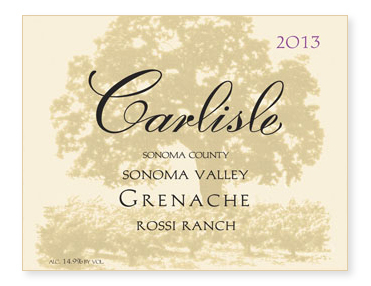 As a result, Carlisle’s first Grenache. (Truth be told, it was cofermented with a small amount of whole cluster Mourvèdre so it’s not quite 100% Grenache.) No new oak. Unfined and unfiltered.